Raith Rovers are hoping to take their frustration out on Forfar after blowing another chance to close the gap at the top of League One last weekend. The defeat at Brechin – the fourth time this season Rovers have lost from a leading position – allowed Arbroath to maintain their 13-point lead, despite slipping up at home to the side who visit Stark’s Park this Saturday. Since beating the league leaders on December 22, had Rovers done what was required and won all their games, the gap would now be down to five points. Instead, the Kirkcaldy side are now looking over their shoulder as they try to remain in second place ahead of the chasing pack, with East Fife a point behind, and Forfar within three. Manager John McGlynn admitted the situation is a frustrating one. “All the games we’ve lost are very similar, and it’s frustrating for everyone because it’s costing us dearly,” he said. “Forfar, Montrose, East Fife and Saturday – these are all games where the points should have been in the bag, but we have an ingredient that’s missing. “There’s a frustration that we haven’t taken advantage, and as the clock ticks down, and the games go by, it’s going to be more difficult. McGlynn is concerned by the similar nature of the goals conceded. “You could almost say it’s bad luck, but the coincidences and repetition of the type of goal we’re losing suggests it’s probably more than just bad luck. “The first goal comes form a long free-kick into the box, and results in one of the cheapest goals you could ever lose, and for us to lose another from one of our attacking set plays is very annoying. “We seem to get punished for the least amount of, not even errors, but just being slightly out of position. We’re losing goals out of nothing, and it’s really difficult to put your finger on. 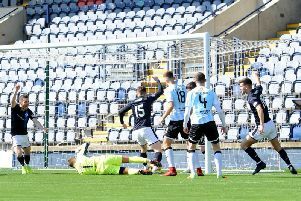 With Forfar now just three points behind, McGlynn expects Jim Weir’s men to come to Stark’s Park on Saturday intent on drawing level on points with his side. “Saturday’s a good game now,” he said. “They’re coming off a cracking result, and in a rich vein of form, so I don’t see them being a team who will come here to just defend. Rovers will add Jamie Barjonas to the squad after acquiring the Rangers midfielder on loan until the end of the season. Lewis Vaughan’s season is over, however, after the striker suffered a cruciate knee ligament injury in the defeat to Brechin. The 23-year-old faces between six and nine months on the sidelines.